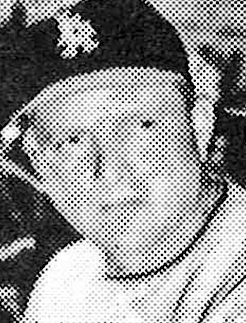 Home / Steve Bilko, Sr.
Nanticoke’s Steve Bilko was one of the greatest play-ers in the history of the Pacific Coast League. Between 1955 and 1957 with the Los Angeles Angels, Bilko hit .331 with 148 home runs and 428 RBI. He was named the league’s most valuable player in 1956 when he batted .360 with 55 homers and 164 RBI. Bilko’s professional baseball career lasted from 1949-1962. In 1953 he played in all 154 games for the St. Louis Cardinals and led the National League in putouts. In 1957 he followed his MVP season with 56 home runs and 140 RBI for the Angels in the Pacific Coast League. In 1961 he hit .279 with 20 homers and 81 RBI for the Los Angeles Angels in the American League. A leg injury in 1962 ended his baseball career. He died at the age of 50 in 1978.